A switch is a device which enables you to connect computers and other devices to a computer network. You may also share Internet connection by connecting a switch to a router. NOTE: In this example, we used the Linksys SE2800, Linksys EZXS55W and Linksys EZXS16W switches. Newer models of Linksys switches (such as the SE1500, SE2500, and SE2800 models) do not have Uplink ports but instead have auto-sensing ports capable of detecting either straight-through or crossover cable. NOTE: If you connect a router or an additional switch to the Uplink port, you cannot use the numbered port next to the Uplink port. In this case, you will not be able to use port number 5. The two (2) ports are wired together, so they cannot be used simultaneously. 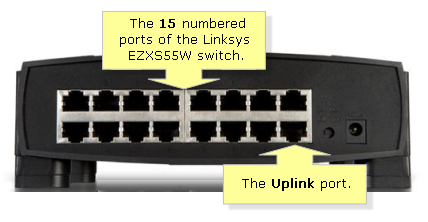 NOTE: If you connect a router or an additional switch to the Uplink port, you cannot use the numbered port next to the Uplink port. In this case, you will not be able to use port number 15. The two (2) ports are wired together, so they cannot be used simultaneously. If you want to add computers or any type of device to your network, you may do so by connecting a switch to your router. You can also share Internet connection through this setup. For more instructions on how to connect a switch to a Linksys router, click here.